In early May two of us at Area3 had an opportunity to tour Spain as guests of Fontile and Porcelanosa. Here is a little summary of the major highlights from our trip. Which include the stunning factories, the culinary delight, and the historical architecture. This was our first trip to this sun soaked Mediterranean country and we immersed ourselves in the food and culture. We enjoyed everything from authentic Tapas to Paella, Sangria and best of all the fresh made Gelato. Too bad I couldn’t have brought some home. Instead I think I packed it on to my hips! Our colleagues asked us when viewing our travel photos if we were on a design or food tour? I see a few spin classes in my horizon. Who could ever forget the Jamon hanging from the ceilings and all those amazing desserts? Walking through Boqueria Market filled with colourful sights and smells from all of Europe is heaven for foodies and locals alike. Barcelona is graced with Gaudi’s unique style of architecture such as Sagrada Familia, Park Guell and La Pedrera-Casa Mila. Sagrada Familia is the most visited monument in all of Spain even though it is still under construction. His passion for architecture, nature and religion is reflected in his mosaic tile, wrought iron and stained glass details. His organic style was inspired by natural forms, play of materials and Gaudi’s wish for his work to be unique. Walking through Sagrada Familia left us in awe of his ability to create a cathedral that is filled with colour from the stained glass, columns that feel like trees and transforms you to a space that is calm and spiritual while at the same time being exciting and design inspiring. Porcelanosa a global leader in the innovation, design, manufacture and distribution of tile, Krion, kitchen and bath products endeavours to be the industry leader by providing cutting edge designs. 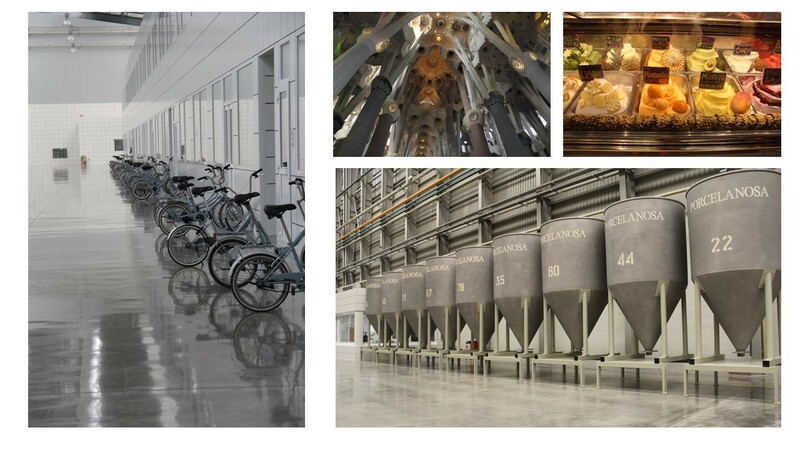 Porcelanosa practises Green standards using natural daylight, water, waste recycling and employee’s having their own bicycle to ride from station to station. Walking through the state of the art factories and showrooms left a lasting impression. Our special thanks to Fontile and Porcelanosa for such a memorable trip to Spain. We made some great memories, met some wonderful people, and had great food and lots of laughs.